Shop for pet tags with confidence at Paws 4 Thought Pet Tags. As one of the leading pet name tags specialists in the UK we are constantly updating our stock. 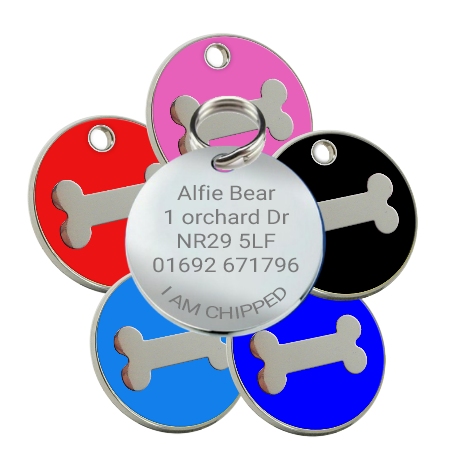 Enamel pet tags on stainless steel are one of our recently added products. These tags are hard-wearing and will never rust or corrode. You can get these tags at affordable prices with just one click. Our expansive selection of enamel tags are made available in an assortment of designs, motifs and colours. The tags are extremely appealing to the eye and durable enough to last a lifetime of dog years. The enamel colour on hardy stainless steel is protected with a resin seal. Choose from fun and exciting styles to make your pet feel special. Our enamel pet tags are monogrammed with different designs. If you are looking for a tag for your canine, you can check out our pet tags featuring bone, dog face or paw motifs. 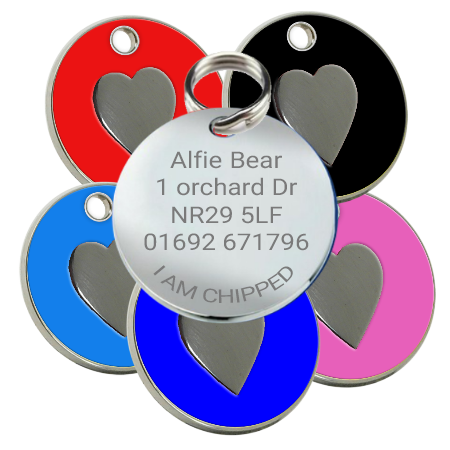 Our pet tags carrying heart shape motifs can be ideal for all types of pets including cats, dogs, hamsters, rabbits and other cute furry friends. 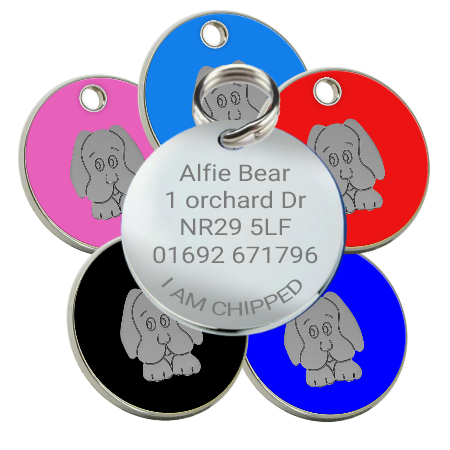 All our pet ID tags are bespoke. 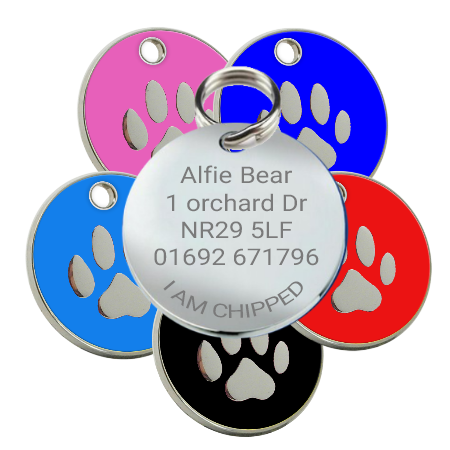 We can engrave the name of your pet, phone number and address on the reverse side of the tags. A maximum of 5 lines with 13 characters each can be inscribed on them. Each one of our enamel pet tags comes with a split ring. This makes it easier for you to fix it to the collar of your pet. For more information, do not hesitate to get in touch with us.